This mapping tool allows you to search for all of the atlas blocks in the state. Click on any given block to access downloadable topographic and aerial PDF maps. See PDF Maps section below for more information on using these maps to track your location within an Atlas block. To sign up for an atlas block, follow the link above and select your preferred block. Click on the ‘Sign-Up for this Block’ link and you will be taken to the Block sign-up form. Please fill out ALL information on this form, so that the regional coordinator can review your request. *Note! 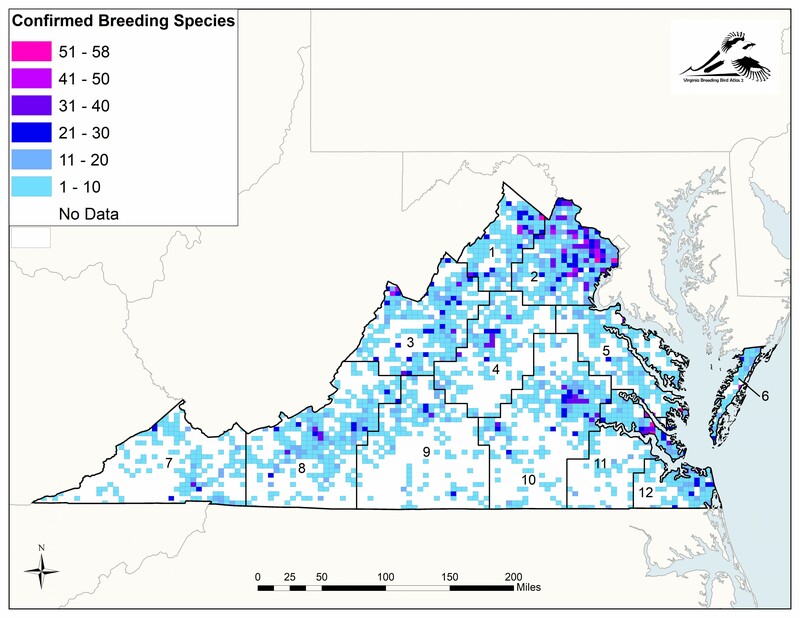 Species lists from the 1st VA BBA are now available via the Block Explorer tool! Simply click on the block of interest, then click the ‘Download 1st BBA Species list’ link to get a PDF summary of the data from 1985-1989. 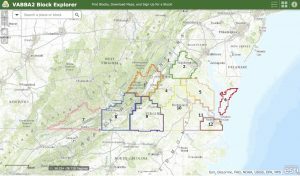 Real-Time Atlas Effort Maps now available via the project’s eBird portal. 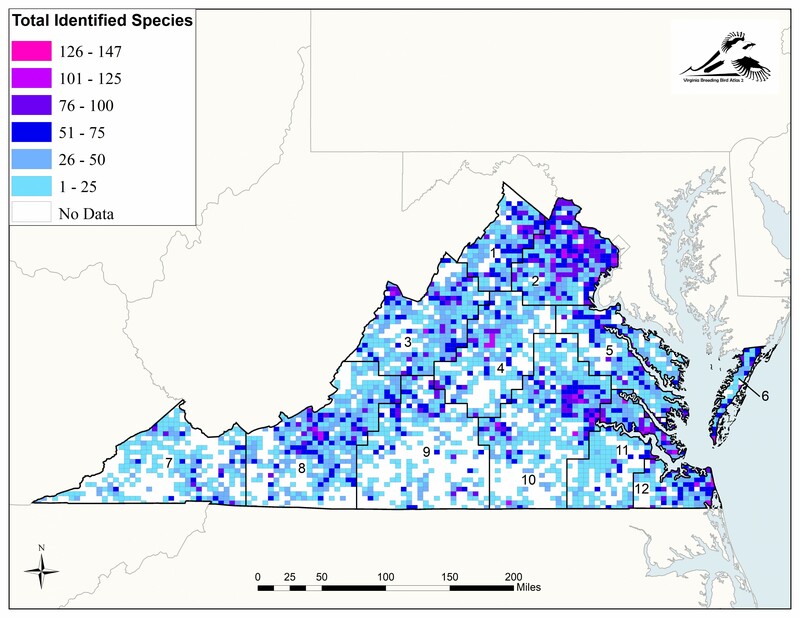 Click through the different map layers to see how many diurnal and nocturnal hours are logged to any given block, as well as how many checklists, total species, and confirmed species have been reported in your area! Species: illustrate block-level species data. This file can be downloaded to your computer or smartphone, then imported to the free Google Earth app. This allows you to view the statewide block map and track your location in the field. A smartphone app called PDF Maps (now Avenza Maps) is available for both Android and iOS (iPhone and iPad) through Avenza Systems, which allows the user to navigate within a pdf map downloaded to their mobile device. This allows you to track your location on the landscape and within your block at all times. Once maps are downloaded to your device, the built-in GPS tracks your movements even when your are out-of-service range. Individual Atlas Block Maps are available via the Atlas Block Explorer tool. Use the app store in your phone to search find and download this free app, then you can download atlas block maps from the Atlas Map tool above. Upload these maps to your phone and get to atlasing! For details on setting up and using the Avenza (PDF) Maps app, see our Atlas eBird article on Location Precision.